Every Thursday night for over 29 years, people have enjoyed dancing to the music of the Rick Brunetto Big Band at the legendary 94th Aero Squadron located at Port Columbus International Airport in Columbus, Ohio. Younger and younger generations discover the band and enjoy dancing to the live music. 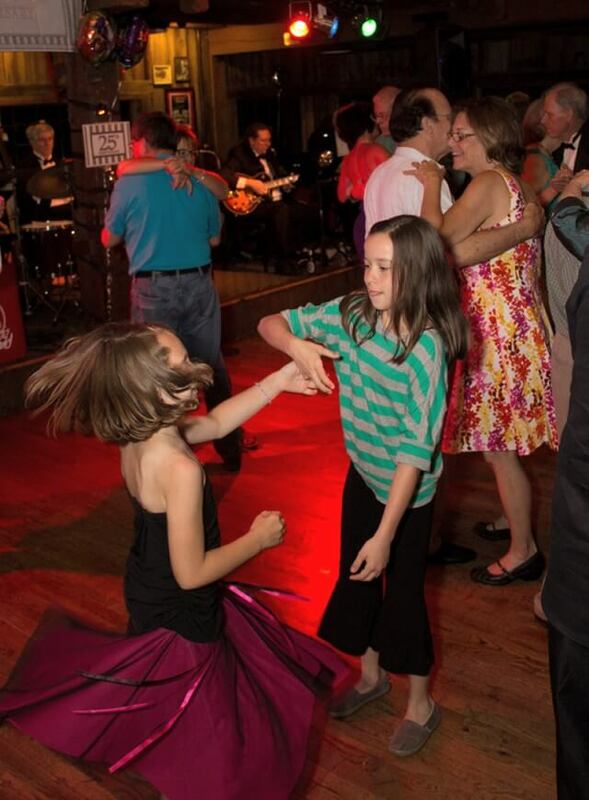 Many times 3 generations are sharing the dance floor which is open from age 5 to 105. Our big band is also available for your special event. When you plan a corporate affair, a fundraiser, or a street dance event you will have lots of people with very different musical tastes in attendance. You need a band that plays it all. The band can play everything from less formal dance songs to classic ballroom dance songs, or of course they can simply mix up styles to bring all people to the dance floor. The Rick Brunetto Big Band is a perfect dance orchestra playing Latin-American and Standard dance songs in the right tempo for the dance lover audience. During our weekly dance event at the 94th, you can expect to hear anything from a beautiful waltz to modern disco hits. These songs will include titles only a big band can play well, other tunes come from the great American songbook. As the evening continues, you will hear the coolest versions of swing, waltz, latin and even Motown songs like you haven’t heard in years. What can you expect when you come? A relaxed atmosphere where you can sit back and listen to the music or stay on the dance floor and dance the night away. The hall is climate controlled, the dance area has a hardwood floor. No formal dress code (shirt and shoes required). Anything from business attire to semi-formal to jeans can be seen every Thursday. The kitchen and the bar are open if you want to dine in or have a drink. Do you celebrate your anniversary or birthday? Surprise your loved one. Call Rick ahead of time at 614-419-5076 or email him at rick@rickbrunetto.com and let him know the occasion. Expect a chat about your favorite songs or even a cake! The band plays 7:30 p.m -10:30 p.m. There is a $10 cover charge per person. WE WILL WORK WITH YOU TO MAKE THIS HAPPEN. Do you need a band for your party? For dance parties, competitions, ballroom galas, fundraisers, award ceremonies, corporate or private celebrations we’ve done them all. Got an idea for something different and unique? Just ask! We have entertained guest as small as 50 people to over 2000 in attendance and we understand the difference between an intimate setting, a gala, a ballroom dance event, or a parade. We know when to play, and when to listen. The band can stay in the background or can be the engine of the night. The song selection, the volume levels and show elements will always be appropriate. We can customize band size, the instrument selection, even more; we can vary these during the night. The dance song set list will be custom built for you based on your specific requests or generic guidelines to adjust to the theme of the event. We have a huge dance music library available at the event which helps us to adjust the songs on the fly to match the mood of the party and your needs. Event planning can be a complex task. Don’t waste time with disorganized bands with limited experience. We are able and ready to help with organizing your music, run the show, and take that burden off your shoulders. Rest easy and enjoy the music, or cut loose and dance away your worries. You can plan on your guests having a great time. Do you want to dance now?